The nation's innovator community has clear ideas for the next president and administration. We should know. 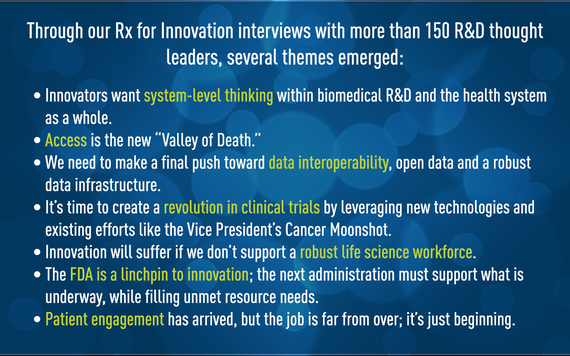 Through FasterCures' Rx for Innovation project, we have interviewed more than 150 medical research R&D leaders across all sectors (academia, industry, nonprofit, government, payers and more), asking the basic question: What should the next administration focus on to propel scientific innovation forward? First, a few facts about the transition process. Did you know that major-party candidates receive publicly funded support immediately following the party conventions to stand up their transition teams? It didn't used to be that way, but the Pre-election Presidential Transition Act of 2010 helped to formalize the transition process. The legislation was an acknowledgement that the transition process is vital to the healthy functioning of the government and should not be left to private fundraising by the candidates. This election cycle, the General Services Administration, which is responsible for coordinating presidential transition activities, was authorized for $13.278 million in pre-election funds for both campaigns and $9.5 million for post-election activities for the president-elect. This helps to cover the costs for a massive amount of work to be done in a few short weeks (President-Elect Barack Obama's 2008 transition team employed more than 800 staff members to handle the load). Among many other tasks, they completed reviews of all federal agencies and outlined the policy priorities of the incoming administration. It's easy to get lost in the torrent of negativity that is this current presidential election. 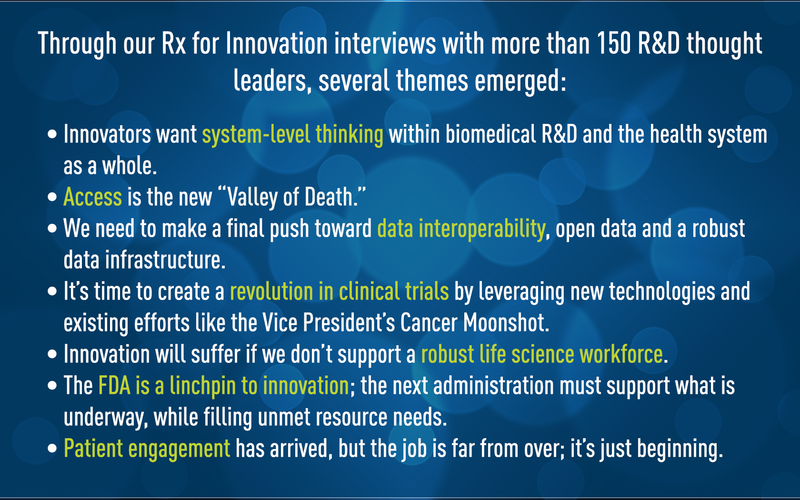 However, these Rx for Innovation interviews unearthed an authentic sense of anticipation that a new administration brings. And the power of what science is bringing forth is both evident and palpable in many areas - for example, cancer (and, specifically, the power of immunotherapy), precision medicine models and data gathering, and understanding the microbiome. Those we interviewed had strong ideas on how to create a new prescription for innovation that would enhance the opportunity for discovery, development and deployment of treatments, interventions and, yes, even cures. Why does the R&D system matter? There was violent agreement that biomedical innovation is vital to America's health and economic well-being. Research-related gains in average life expectancy from 1970 to 2000 have an economic value estimated at $95 trillion, about $3.2 trillion per year. Cancer death rates have been dropping by more than 1 percent annually for the past 15 years. Each 1 percent reduction in cancer deaths has a present value of nearly $500 billion to current and future generations of Americans. A full cure would be worth approximately $50 trillion -- more than three times today's gross domestic product. The National Institutes of Health (NIH) alone, through its $32 billion budget, supports more than 350,000 U.S. jobs and $60 billion of economic activity annually. Innovators want system-level thinking within biomedical R&D and the health system as a whole. There is awareness that the public policy fights on value and pricing have harmed the community's common goal of access to better therapies and cures. We need to convene thought leaders, build bridges and take necessary steps to make the system work, as a system. This won't be easy, and we'll need to build "translation hubs" to get the health cures system to be able to talk to the health care system without leaving any sectors behind (e.g., patient groups who got into business to de-risk the science, not become experts on the complexities of the American health-care system). Access is the new "Valley of Death." A concerted effort to update the value and coverage of new medical products is needed to ensure that patients can access innovative therapies and cures in a sustainable way. The Centers for Medicare and Medicaid Services (CMS) has a role to play in creating a "translation hub" so that innovation is nurtured, analyzed and brought into the reimbursement fold. This issue will require intense listening on all sides. The stakes are high (and rhetoric is, too), and interviewees called for focused efforts to advance access discussions and policy. In the same way the Food and Drug Administration (FDA) has embraced and, at times, struggled with this new paradigm of patient input, there were many interviewees who felt CMS needs to take a look at these models and bring patients into the fold. As CMS goes, so go other payers. It's time to create a revolution in clinical trials by leveraging new technologies and existing efforts like the Vice President's Cancer Moonshot. There is universal dissatisfaction with the current state of affairs in both recruitment to clinical trials and also the static nature of the tool itself. The federal government wields tremendous power to push forward cheaper, faster and more targeted clinical trials using innovative tools like real-world evidence, telemedicine and mobile health. Oh, and there was tremendous support for a health citizenship effort convened by the president that could build off the work President Obama began in this arena (#healthcitizenship, perhaps?). We need to make a final push toward data interoperability, open data and a robust data infrastructure. FasterCures has been focused on how best to evolve this system and "think research." On the clinical side, we need to move beyond meaningful use and ensure true interoperability of electronic health records. In research, we must use NIH's power of the purse to encourage open data by requiring data interoperability as a condition of federal funding. There was a plea from interviewees to resist the urge to create a new data repository with each new collaborative initiative, but rather to strengthen existing systems and require new ones to be interoperable with existing infrastructure. Innovation will suffer if we don't support a robust life science workforce. The NIH is a crown jewel in U.S. innovation efforts and needs to get off the appropriations carousel and onto stable and consistent funding. But resist the temptation to keep layering on to existing funding streams. Interviewees called for a process to look critically at how NIH dollars are spent: what diseases; how high-risk, high-reward mechanisms fit into the portfolio; and, of course, how young researchers can be incented to stay in the field. Supporting young scientists with new and/or enhanced funding tools is imperative if we plan to have a life science workforce. The grind to secure funding can't compete with the perks of making a living in other sectors. The FDA is a linchpin to innovation; the next administration must support what is underway, while filling unmet resource needs. FDA leadership is on the right track and is promoting innovations throughout the medical product regulatory process. However, the agency lacks adequate resources and human capital required to accomplish its vitally important mission. The new user fee agreements (the Prescription Drug User Fee Act and Medical Device User Fee Amendments) are moving issues forward, but nothing can replace solid support, in words and deeds. Patient engagement has arrived, but the job is far from over; it's just beginning. It's critical that the next president support the current trajectory and invest in the science of patient input, which is vital both for medical R&D but also to tighten up the value equation. The system has seen an increase in meaningful patient engagement in biomedical research, product development and regulatory decision making. To maintain this trajectory, investments must be made to mature the science of patient input. FasterCures plans to release our completed Rx for Innovation recommendations for the next administration at our upcoming Partnering for Cures conference in New York City (Nov. 13-15). Don't miss the panel discussion with policy warriors discussing the next steps for the newly elected president: Mixing Policy and Politics: Opportunities and Challenges for our President-Elect. The transition teams and all of us in the biomedical innovation world should heed the advice of the great philosophers of Fleetwood Mac: "Don't stop thinking about tomorrow. Kevin M Murphy and Robert H Topel "The Value of Health and Longevity" U. Chicago and NBER, 2006. http://www.ucema.edu.ar/u/je49/capital_humano/Murphy_Topel_JPE.pdf, accessed October 11, 2016. 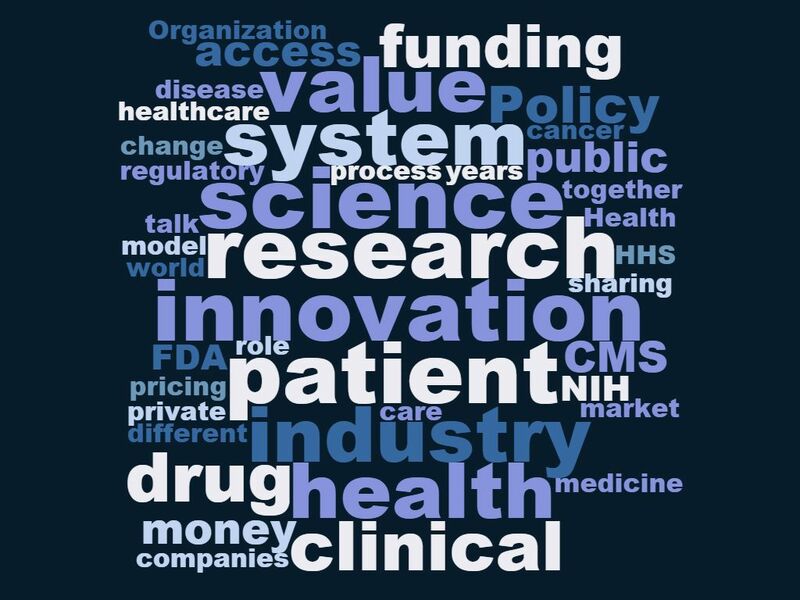 "NIH's Role in Sustaining the U.S. Economy: 2016 Update," Dr. Everett Ehrlich, United for Medical Research, 2016. http://www.unitedformedicalresearch.com/wp-content/uploads/2016/05/NIH-Role-in-the-Economy-FY15-FINAL-5.23.16.pdf, accessed October 10, 2016.